A-HOTEL.com - Luxury and cheap accommodation in Hallormsstaður, Iceland. Prices and hotel, apartment booking in Hallormsstaður and surrounding. This indicative offer was derived from the most recently booked accommodation in Hallormsstaður and sort by the price, from cheapest Hallormsstaður accommodation to the most expensive hotels. To select accommodation by your preferences we recommend to choose from 3 accommodation offers in Hallormsstaður in total. By entering the dates of your overnight stay in Hallormsstaður and using the filter tools you can sort the best possible accommodation for you. The entered dates of your stay are crucial for the most accurate offer as it derives all the online information on pricing and availability of Hallormsstaður accommodation. Then you can book the selected Hallormsstaður lodging (hotels, apartments etc.) immediately. Beautifully located in a forest area by Lake Lagarfljot, 25 km south of Egilsstadir, is the Hotel Hallormsstadur, close to hiking trails and various recreational opportunities. Guest room and cottage accommodation with a private bathroom and shower is offered at Hotel Hallormsstadur. Set in Hallormsstaður in the East Iceland region, Hafursá við Hallormsstað Holiday Home offers accommodation with free WiFi. The units have a fully equipped kitchen with a microwave and a toaster. Guesthouse Grai Hundurinn is 15 minutes’ walk from Atlavik Bay, 25 km south of Egilsstadir. Wooden floors, a TV and desk are standard in all rooms. This family-owned, eastern Iceland property is located on Route 95, about 17 km from the town of Egilsstadir. 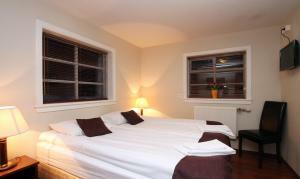 It offers cottage and guest room accommodation with views of Sandfell Mountain. Surrounded by mountains and scenic nature, this family-run guest house is 6 km from Hengifoss Waterfall. It offers free Wi-Fi and apartments with a kitchenette and views to the Hallormstadur Forest. Located on a farm in Vallanes, these cottages include a kitchenette and views of the river and mountains. Egilsstadir Airport. Located in the East Iceland region, Sólbakki Holiday Home features a terrace. Guests staying at this holiday home have access to a fully equipped kitchenette. Featuring accommodation with a terrace, Rubin Holiday House Hreidur is situated in Úlfsstaðir. Offering free WiFi, the property also has barbecue facilities. Offering free WiFi and mountain views, Rubin Holiday House Valhöll is an accommodation located in Úlfsstaðir. This holiday home offers barbecue facilities, a garden, as well as a terrace. Set on an organic farm, Móðir Jörð Organic B&B in Vallanes offers accommodation in Vallanes. Free private parking is available on site. Surrounded by nature, this guesthouse is within 10 minutes’ drive of Egilsstadir and Lagarfljot River. Rooms have access to a shared lounge and free hot drinks at all times. Offering free WiFi and mountain views, Rubin Holiday House Blondalsbud is an accommodation located in Úlfsstaðir. Guests staying at this holiday home have access to a fully equipped kitchen. These holiday homes all offer a private terrace with barbecue facilities, in addition to a well-equipped kitchenette with free coffee and tea. Egilsstadir town centre is a 8-minute drive away. Skarðás Country Cabins offers two-bedroom cottages with a private terrace with outdoor furniture and barbecue facilities. Free WiFi is available. Opened in June 2018, Hotel 1001 Nott offers modern accommodation 5 km from Egilsstadir. The hotel features outdoor hot tubs overlooking Lake Lagarfljót. Situated in Egilsstadir, Setberg features free WiFi and units fitted with a kitchen and terrace. All units are fitted with a microwave, toaster, a coffee machine, a fridge and kettle. Located in Egilsstadir in the East Iceland region, Home with a View has a balcony. Complimentary WiFi is provided. Boasting a terrace, Tehúsið Hostel is set in Egilsstadir and also provides a shared lounge and a bar. Featuring a shared kitchen, this property also provides guests with a restaurant. Featuring free WiFi and a restaurant, Wilderness Center / Óbyggðasetur Íslands offers pet-friendly accommodation in Óbyggðasetur. Guests can enjoy local and home made meals on site. Set in a renovated farmhouse, this guest house is located by Lake Lagarfljót in Eglisstadir village. It offers bright and modern rooms with a flat-screen TV, free Wi-Fi and a private bathroom with shower.